The National Museum of the Pacific War will pay tribute to all who have given their lives serving in the United States Armed Forces, Monday at 10 am. 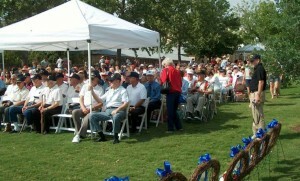 Including keynote speaker Captain Rex L. Curtin, USN, rifle salute and the placement of wreaths at the Memorial Wall. Standard museum admission applies, but program is free and open to the public. In the Memorial Courtyard of the National Museum of the Pacific War, 340 E. Main.